A vegan or vegetarian meal can include luscious gourmet dishes that are nevertheless easy to prepare. Use these recipes that are suitable for a dinner party or romantic meal for two. Enjoy appetizers, soup, salad, entree, side dishes, and dessert. 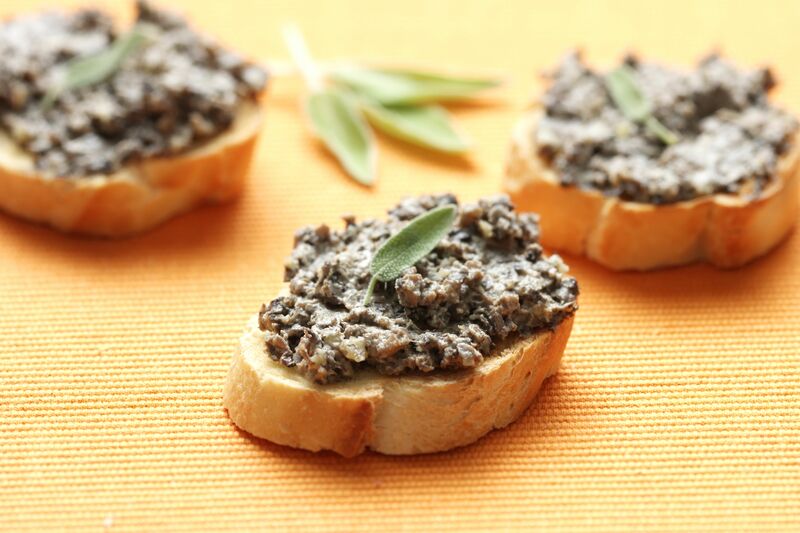 Serve this Herbed vegan mushroom pate as an appetizer at your cocktail party or with drinks before your gourmet dinner. You can use it to top toasted slices of baguette or your favorite vegan crackers. You can serve this spicy mango ginger soup in a shot glass as an appetizer or in a bowl as your first course. It's a raw food recipe packed with flavor that will delight your guests. It's perfect for a summer dinner party on the patio. The classic vegetarian avocado caprese salad gets an update with the addition of avocado. It's the perfect summer salad when you can get garden-ripe tomatoes and fresh basil. Dress it with olive oil and balsamic vinegar with a bit of sea salt and fresh cracked black pepper, or drizzle it with a bit of honey as a variation. For a vegan version, substitute vegan mozzarella. Make a show-stopping dinner with this vegetarian gourmet vegetarian mushroom risotto with truffle oil using truffle oil. It pulls no punches with luxury ingredients including whole milk, butter, white wine, cheese, and truffle oil. It's perfect for a romantic dinner. You can make this gourmet vegetarian tabbouleh salad as your main course, especially for a summer meal. It is packed with protein and served chilled. At other times, it makes a hearty starter or side dish. Traditional gnocchi is made with potatoes and is usually a starch course. Turn it into a protein-packed main course by making vegetarian tofu gnocchi. Then choose the gourmet sauce to use with it, such as vegan pistou sauce, vegan mushroom cream sauce, or vegan artichoke and walnut pesto. This vegan and vegetarian sun-dried tomato risotto looks lovely on the plate and bursts with fresh basil and parsley as well as sun-dried tomatoes. It uses vegan Parmesan cheese. These vegan oven-roasted sunchokes (Jerusalem artichokes) are an excellent side dish to replace typical potato dishes. Sunchokes are a seasonal winter vegetable and can grace your table for the holidays or that romantic Valentine's Day dinner. A beautiful vegan ratatouille will look great on the table and pack lots of flavor. It's a great summer dish when zucchini, eggplant, and bell pepper are in season in your garden or from the farmers market. End your gourmet meal with a decadent dessert such as this vegan tofu peanut butter pie. Not only does it have just a handful of ingredients, it also is a no-bake dessert. You combine the ingredients in the food processor, pour into a prepared vegan pie crust, and chill it. You can make it more elegant with a topping of vegan chocolate swirl and chopped nuts.